One of the (many) things on my to do list is quilt my Tula Pink Houndstooth quilt. It's been basted and sitting in my studio since last summer while I figured out how to quilt it. Poking around the web it seems like a lot of people stipple these but I don't think it does anything for the design and with the bold color scheme whatever color I choose to quilt with was going to really show on half of the blocks. The fabulous Angela Walters quilted Tula's and choose to do straight line quilting in light parts and swirls in the dark. 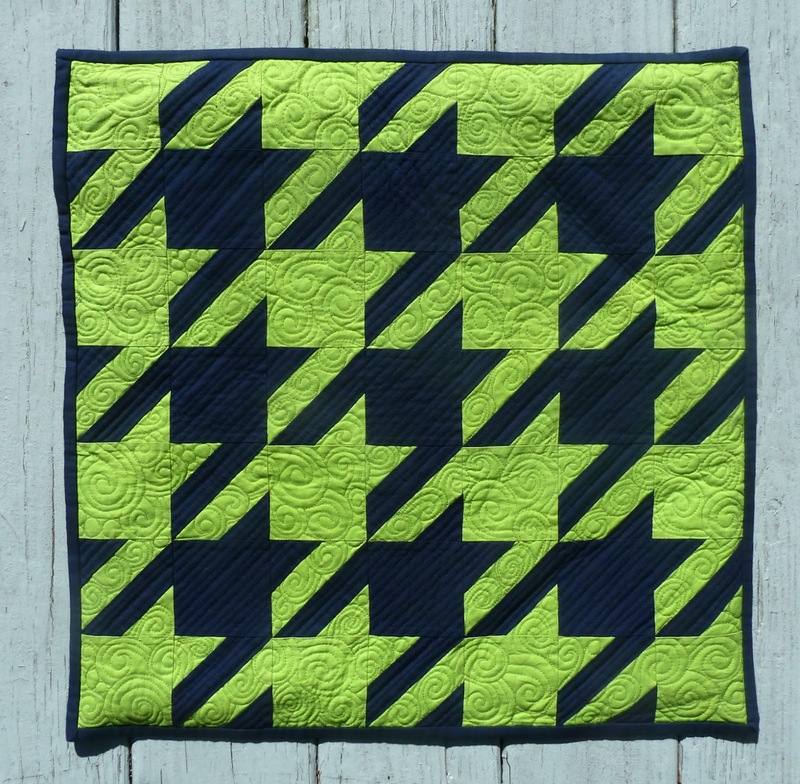 My quilting skills are definitely no match for Angela's but I like the effect so I thought I'd give it a try. 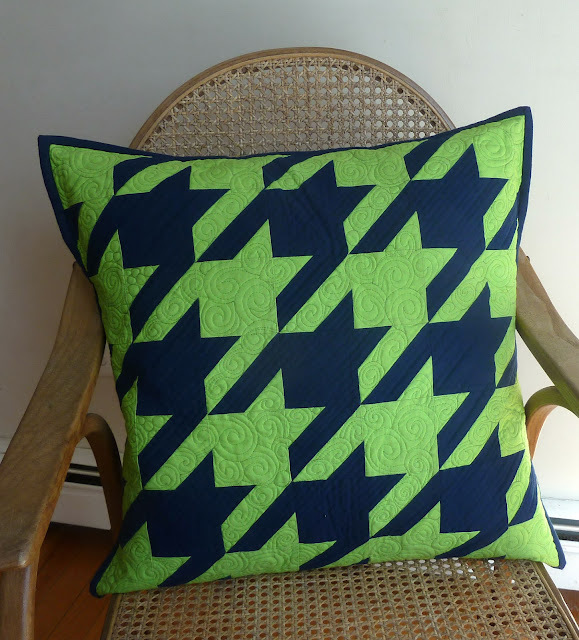 Rather than attempt it on my quilt I shrunk the pattern down to make a pillow sized practice version, this time in Lime & Navy. 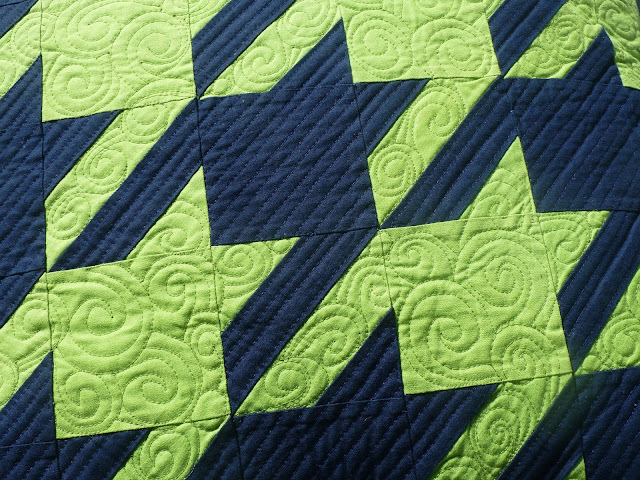 In the navy sections I quilted 1/4" lines which was actually harder than I expected given the irregular shape. For the green sections I pulled out my go to, Free-Motion Quilting with Angela Walters and tried some concentric circles. It still needs more practice to get my circles round but I'm pretty pleased with the results. I happened to have a lime green zipper on hand so I went with my go-to zipper installation tutorial by s.o.t.a.k handmade for the back. 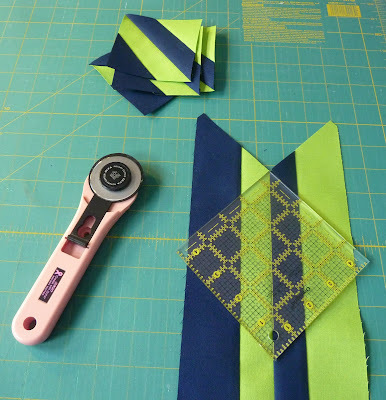 Fabrics: Kona Storm & FSDS Lime. Thread: 50 wt. Aurifil in Midnight (2745) and Fern Green (2888). Very cool. I love the colors. Great job. Come over and see me @ #101! Have a good weekend. 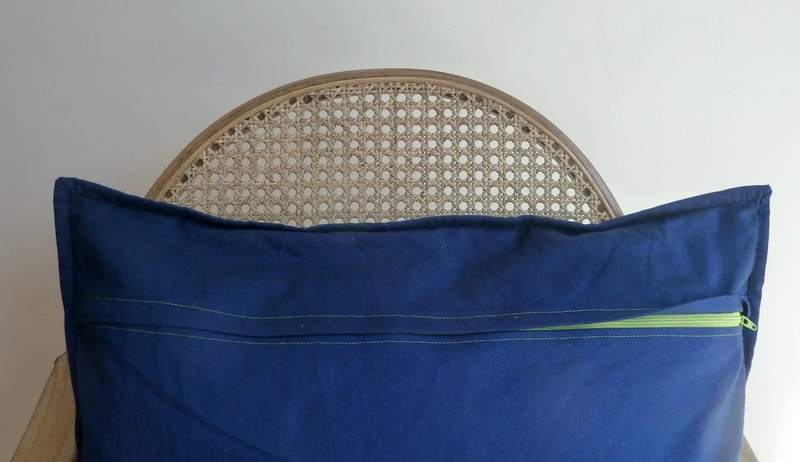 Really lovely, it's nice to see some masculine colours. I would like more information on how to do the strips like this. Love the pillow idea.